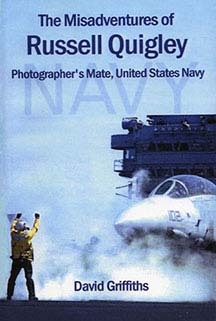 The Misadventures of Russell Quigley is a collection of hilarious short stories woven into the fabric of Russell's life as a Navy photographer. Russell was the kind of man that irritated everyone; but, he was a man of principle. And, Russell had a problem with bullies. He could not let a bully go unchallenged. He also had a tremendous fear of authority and; therefore, of making mistakes. And, if he couldn't make any mistakes, then you shouldn't be able to either. It is not surprising that Russell Quigley had a dozen captain's masts and a hearing for a summary court martial in his first four years. What is surprising is that after a few years as a civilian, he came back for more. He vowed to do better. And, he did-for a while. You see, it was not something Russell could easily control. The Navy violated a lot of principles. And the Navy had a lot of bullies. I grew up in South Dakota during the depression. I remember eating a lot of biscuits and gravy and getting a whipping for putting both butter and jelly on the same piece of toast. I also remember my mom complaining, when things got a little better, that my older brother wouldn’t stop hiding cookies under his clothes in his chest of drawers. They would get old, crumble, and get all over everything. I think I was born afraid. Maybe it was my father's explosive temper. Anyway, I spent a lot of time hiding out behind the garage. And I was angry all the time. I don't know why I was angry; I just know that I don't ever remember seeing a picture of me where I wasn't standing a foot away from the rest of the family, arms folded, pouting, and looking down. I started selling papers on the street when I was in the third grade as much to get out of the house as for the money. And it wasn't just the family. I was the kind of person everybody loved to dump on. I attracted the attention of the school bully, Abel Leaman, who was a year ahead of me. He wasn’t satisfied just to beat me up; he had to beat me up every day after school, and every day I went home crying. My mother complained to my dad; my dad complained to me. He said the bully would never stop bothering me until I showed him that I wasn’t afraid of him. Well, I was more afraid of my father than I was of Abel, so I knew what I had to do.Abel always managed to get out of class first and be waiting for me. He beat me up again, but this time when he got up to leave, I tackled him from behind. As a result of his surprise, I managed to hit him once in the face. He rewarded me with the most severe beating ever. He bloodied my nose and puffed both of my eyes. But when he turned to leave, I tackled him again. He beat me up again; I tackled him again. He never got more than 10 feet before I tackled him again. He started crying when it got dark. He wasn’t hurt; he just wanted to go home. He kept asking me to let him go home, but I wouldn’t stop. Our parents and the police caught up with us at the same time. My mom was furious. Abel’s mom called me a monster. The police were annoyed. But there was a twinkle in my dad’s eyes. Whenever I saw Abel after that, I turned towards him just to watch him turn and go the other way. I vowed never to be afraid again and to stand up against all bullies including my father. Ebook (All Formats): $2.99 Read it on your iPhone! The Misadventures of Russell Quigley was published for free by CreateSpace. Get access to FREE book publishing tools, resources, and a growing online community of authors. Learn how.